The Dating Game and Math Class - Set The Hook. Today, I get the opportunity to come into one of our math classrooms and teach. Ms. Depweg handed over her class, and for this, I am incredibly grateful. For one, it's giving the teacher a bit of a much-deserved break, but it's also a chance for me to remember why I'm doing what I'm doing in education. Sure, the technology side of things is great and creating lessons and connections are fun, but it all comes down to the kids and how we are helping them. So, on this wonderful October 30th, I get to talk to kids... about dating. YOU'RE GONNA DO HHHHWHAT?! WHEN? WHYYYYY? It's crazy how being out of the classroom for even a semester and a half can seem like an eternity. I forgot how much I used to walk, even though I remember walking around the room all the time. I forgot how much I enjoyed interacting with students, even though I remember and cherish many of the conversations. I forgot how much I loathed dealing with students who were disrespectful, even though I will never forget them or those situations. More importantly, I forgot how much I enjoyed teaching math, even though it has always been a passion of mine. To the lesson itself, it was a Mathalicious day. You know, the one where we don't really start off with math, but with a conversation. Today's conversation was centered around an acceptable age range for people to date and using inequalities to represent the data. Because we only have one day for the lesson, it needed to be scaled down quite a bit. We started with a video of an 8 year-old walking with an 18 year-old, talking about how, as time goes on, their difference in age wouldn't be as creepy (leading us to believe that she had a crush on the older boy). Getting over the natural high school hurdles when bringing up dating was pretty easy when we talked about how creepy it would be for an 8 year-old to date someone who is 18. It got fun when we got to the 38 and 48 year-old scenario because most kids were in agreement that it was perfectly fine, even though the difference in age was always the same. From here, I needed to scale a little. We used the graph in Desmos to come up with a few more age ranges and determine their level of creepiness. I liked doing this because it led us right into the table that students would fill out about what age would be the youngest they could date as they get older. Most students were able to fill the table in quickly and get right into the weirdness of a 10 year-old dating a "younger" 12 year-old. This didn't make sense... Kids were confused... and it was perfect. From here, we were driven to the age restriction in which the formula wouldn't work - 14 years old. Our next step was to graph out the "half plus seven" rule. Students worked to plot the points and graph it out, only to hear that they were ALL WRONG. It's my fault, really, for not reminding them that their graph should start at 14 years. This was a good conversation about restrictors of functions and how they help us adequately define a legitemite range. Who wants their 4 year-old dating a 9 year-old? Not me, but let's stick to the math. STAY ON TASK! NO DATING 'TIL YOU'RE 30! As students began shading in their inequality, many of them stopped. "Wait, this doesn't make sense" was a phrase heard throughout the day. What was happening? 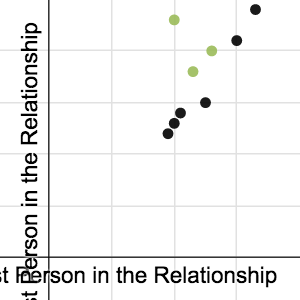 Well, students were interpreting the data on their graph and realizing that there should be some sort of cap on what age should be the oldest a person could date. After all, it didn't make any sense to have a 20 year-old dating someone who is 180. Well done, Ms. 180 year-old person, well done... but NO. During this part of the lesson, we went back to the table and discussed that there must be some sort of lid we can put on the ages to make them reasonable, so that Great Great Great Great Grandpa Stevens isn't dating someone who just turned 28... or 40... or 90 (Ewwwwww). Students had a chance to graph the second portion of the dating scenario that would give them a range of acceptable dating ages and this was quite the struggle. y <= 2x - 14 being graphed was tough because, in part, the graph paper didn't go below zero. Plus, it just didn't make sense. This part was alright by me because it invited good conversation. We built the y-axis down to -20, plotted the y-intercept, and students took off from there with the graphing. For the most part, kids were able to get into the lesson without too many complications. We finished the lesson with a dreadful "But wait! But wait! The best part..." and for that, I'm pretty bummed out. Datelines is definitely a two, maybe three day lesson. We didn't get to the celebrity portion of the Romance Cone, or even a chance to lay the hammer of this range being called "The Romance Cone". However, I wouldn't just want to drop it in at the end of the lesson, so I'm OK with leaving that out. Hopefully Ms. Depweg will have a chance to go through some of the celebrity couples to finish the lesson, but it's OK if we didn't - it was a great math day. Now leave me alone as I kick back, relax, and enjoy a nice glass of... oh boy. That's how it went. Now I want to reflect on how it actually went. Naturally, I have a great deal of respect for what teachers do on a regular basis, but something changes when you're in charge of the class for a full day. I've observed plenty of teachers in the role that I now have, and it's easy to sit back and "sofa coach" them, critiquing what I would've done differently. Now, this was my class for the day. Ms. Depweg was there the entire day, but I was in charge. Before the day began, I was told that the kids were outstanding yesterday. Y'know what that means? I loved that the kids were true to their form today and not the angels they were yesterday for her. She got the chance to see me struggle with the same students and scenarios that she deals with. More importantly, she got the chance to see her class from a different perspective and realize that she is doing a good job with the kids she has. This is a more important piece that a lot of teachers never get the chance to experience, only comparing their stories to the stories of their peers' experiences in the staff room during lunch. There was Kristoff, a student who is constantly out of his seat, plays the "why you gotta pick on me" card often, and riles up his colleagues. There was Olaf, a student who habitually hangs her head to avoid being called on because she just. doesn't. get. it. There was Anna, a student who is socially awkward, kind of the self-acclaimed teacher's pet, who loves sharing out her full response as if it were a dissertation defense. There was Elsa, a student who is normally engaged, but had her head on the desk, headphones in, and just didn't want to be a part of the world she was surrounded by today. Aside from the blatant change of names, all 4 of these things happened today. And more. It was a real day of school, giving me a nice shot in the arm of the respect that I need to constantly have for the difficult job that teachers take on. Afterwards, Ms. Depweg and I talked about how to deal with, or help, these students and others who so desperately need it. As a technology coach, as a human being, I felt like I let her down by saying "I don't know". The sad part is, it's the truth. It's funny to tell teachers that I'm going back to the classroom to teach a lesson. They look at me crazy and ask why, tell me good luck (because I'll need it), tell me I'm crazy, and a myriad of other responses, mostly neutral or negative. I don't think that this is a red mark on the teacher's perspective of their profession, but more of a reason to respect them even more. We don't truly appreciate the work that teachers like Ms. Depweg and others around the world who give everything they have for more than 180 days a year. Thank you to Ms. Depweg for allowing me the opportunity to come in and hang out with your class. You gave me a refresher of why the career I have chosen has been worth the time and effort that it has taken. Thank you to Karim and the Mathalicious team for creating lessons that are more than just Real World - they are interesting. I got to go in and talk to kids about dating. In a math class. There was Kai, a student who greeted me right away by name, clearly not one of "the cool kids" by his peer's standards, but was so willing to make me feel welcome. He was respectful, asked about me, and genuinely engaged in the activity. As I was leaving the school for the day to return to my job of supporting teachers and away from the classroom, I was given the best parting gift I could've asked for. "Hey Mr. Stevens, thanks for being in our class today. Have a great day"
NICE!! Glad you had this opportunity. Love your honesty in your reflections. Makes me feel appreciated vicariously! Thanks for that! My classroom is open anytime you want to try another lesson. Oof. That's a good reminder. It's time for me to get back on the horse. Real Tears!. You made me cry! I am so glad now that I did not get your job. I would miss my students so much. I love that my students look forward to my class and that they say that it ends all too soon. I love the mornings when I have several students who come in and help with taking down chairs, setting up labs, organizing the recycling. I love the fact that when they leave my room, they often say thank you and always say goodbye and have a nice day or weekend. I love that when they see me out in the quad, they call out and or greet me by name and wave even though they know I don't know who they are (my long distance vision is pretty bad and I generally do not wear my glasses unless I'm driving). I would miss that so much. Thank you so much for being our tech coach. You are such a great help to folks like me who need coaching. I am grateful that you got the job because I think I would find myself lost being out of the classroom at this point in my career. I think I will continue to present on the side and work to learn more skills so that I can influence those at my school site but I GET TO TEACH my students every day!